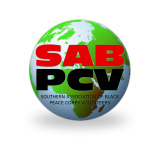 Welcome to the Southern Association of Black Peace Corps Volunteers (SAB PCV) Website. We are dedicated to promoting community service and raising awareness in African-American communities about Peace Corps and its many programs. Through partnerships, special events and outreach activities the SAB PCV strives to strengthen Americans’ understanding about the world and its Peoples. The SAB PCV is also committed to lending its support to minorities involved with Peace Corps, including applicants, volunteers and their families and returned volunteers. Enter your email address to follow SAB PCV and receive notifications of new posts by email.